After you all liked my last silhouette image so much, I figured I ought to share a more recent one from our trip to the Florida Panhandle. Sanderlings are one of the more active and fun bird species to watch cavort around on the shoreline as they feed. 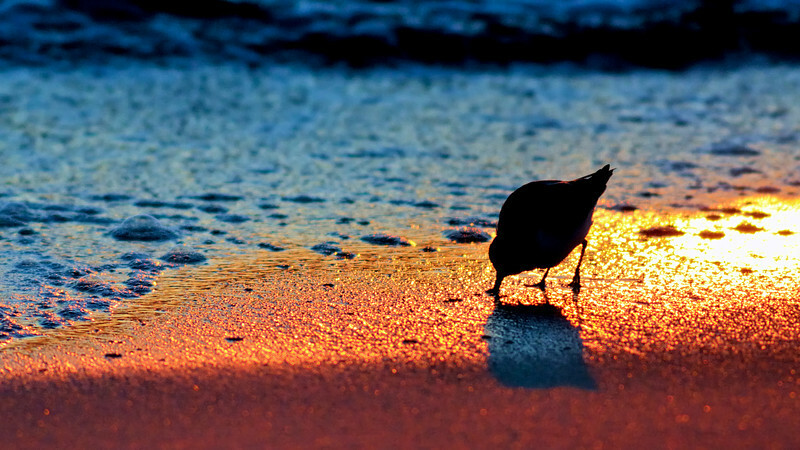 Happily, Sanderlings are one of the most widespread wintering shorebirds in the world. Just about any tropical or temperate sandy beach worldwide should have these merry pranksters running the shoreline in winter. Come summer most of breeding population will high-tail it to breed in the high Arctic. So if you're on the coast and need an excuse to get out this winter, go enjoy these fun wintering birds! If you wish to learn more about these neat birds, you can view the source for my species information from the Cornell Lab of Ornithology right here ( http://www.allaboutbirds.org/guide/Sanderling/lifehistory ) .